More on my Instagram account, @helloquiet. Second travel for the year was to Bohol during the first week of February with two of my friends from work, Charm and Farn! Why Bohol? Personally, it was the Chocolate Hills. I know Bohol is more than just that but after the earthquake that destroyed some parts of it, you know, I just had to see it. It's a crime not to. Not when you have the opportunity and means to travel and you've never even seen it at one point in your life. And because it was just an over the weekend trip (peak season at work prevents us from filing long vacations), we just purchased this tour package last year from Farn's friends that was originally a Palawan travel package, but since they were not pushing thru, we bought it from them and had the tour changed to Bohol. Since we wanted something laid back so we could recharge for the upcoming busy week (and we had Farn's kid with us), we opted for a standard day trip to the tour spots of Bohol. 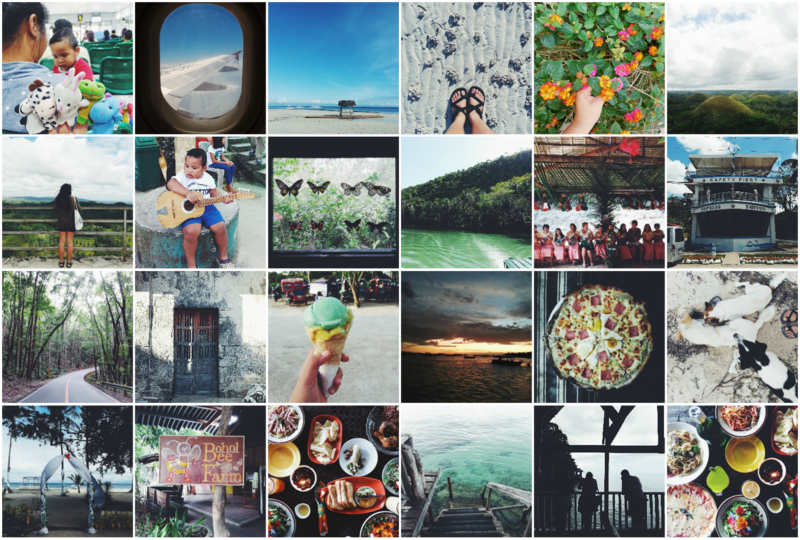 I'm sharing here my feeble attempt (hahaha) of making a simple travel guide for a 3 days, 2 nights stay at Bohol and some bits of information regarding our trip. Included in our travel package (we paid around PhP 6,000 each) were round trip plane tickets, accommodation (with free breakfast), the tour itself, of course, and the fees needed, and the transportation to get around. We were booked with Air Asia (I'm not sure how much the tickets cost), and the travel time was around 1 hour and 10 minutes. We met at Panglao with 2 of our other friends, Jom and Terrence, who took a plane to Cebu and rode a ferry to Tagbilaran City. So that's another option. Muro-Ami Seaside Inn and Restaurant. It's located at the more relaxed area of Panglao. If we were in Boracay, this would be in Station 3. Pros: With working heater, located by the beach, quiet, friendly people and the food is good. Cons: Water kept getting shut off without even telling us, which, of course, is such an inconvenience. I think they weren't able to establish with the agency that booked us that our stay included free breakfast, so when we were about to order breakfast, they had to confirm it first with the travel agency. It's good enough. You get exactly what you paid for. There are a slew of cheap hostels in Panglao like Muro-Ami which, I think, costs around PhP 1,000 - PhP 3,000 per night, but if you want something of a five-star flavor, there's also The Bellevue. On the side of Alona Beach, there's tons of hotels and hostels, too. There's something that caters whatever budget you have. Chocolate Hills. This was first in our itinerary because, I think, this was the farthest. It was nice to see this landmark finally in all its green beauty. There's also this ~200-step staircase that you can climb to reach the view deck for a fantastic view of the hills. Really breathtaking. Simply Butterflies Conservation Center. The place was small and the tour was short but it was very entertaining. Our tour guide, JB, was chock-full of trivia and jokes and was downright hilarious. Everyone from there was really jolly and fun to talk to. They have a souvenir shop there, and don't forget to try their ice cream. ShipHaus in Batuan. It's a house that's built simulating a shipping vessel (both inside and out!) that's a new tourist destination and landmark in Poblacion Norte, Batuan. I've read on some other blogs that it was supposed to be a residential house but since it's appearance began drawing in tourists, they made it open for the public. Entrance fee is PhP 20. Tarsier Conservation Area. Finally saw these little furry cuties in the flesh. Didn't enjoy the trip so much though as it was raining when we got there. Bilar Man-Made Forest. While on the road going to Chocolate Hills from Loboc, I noticed a sudden gloom in the surroundings. Looking up, we were suddenly surrounded by tall trees that I found out to be mahogany. This is one of my favorite spots in Bohol. It was really magical. Our driver told us it we were passing by a man-made forest. It was quite hard to believe that something looked to picturesque was not by nature. Loboc River Cruise. We had our buffet lunch at a floating restaurant that would travel the course of a part of the Loboc River. The food was okay, the view was fine, too, (I guess the river and the villages surrounding it got affected by the earthquake) but what I liked the most was when our boat made a stop at a jetty and the locals gave a cultural performance for the guests. Everyone was just clapping their hands and some of the foreigners danced along! There's a singer on board as well that entertained everyone while eating. Rate is PhP 450. Kids 12 years and below are for free. Baclayon Church. There were a lot of churches greatly affected by the earthquake last 2013. Some of them are, as of the moment, being rehabilitated and some just left the way it is. We just made a quick stop here at Baclayon Church before going to our next destination. Alona Beach. If you're not staying somewhere along Alona Beach, make a quick trip there. We met up with Terrence and Jom there since that's where they stayed, had a quick dip and had dinner and drinks by the beach! Jasz Bar and Restaurant's Farmer's Pizza was just so delish! The usual local delicacies: peanut kisses and peanut fingers. They also sell mango and cashew butterscotch. Also, kalamay. Just a reminder though, those kalamay in hollowed coconuts need to be checked-in. Everything in Bohol Bee Farm's souvenir shop. I highly recommend all their spreads: honey, mango, pesto and malunggay flavors; their organic honey; their salad; their ube. If Bohol Bee Farm is part of your itinerary, might as well do pasalubong shopping there.